How do you record languages spoken in a war zone? It is a challenge that Yousif, GRN Australia recordist, has been working on for several years. Yousif is from the Nuba Mountains of Sudan and Vivian, his wife, is from South Sudan. His heart's desire is to provide Good News in the languages of both places. Sudan and South Sudan are both experiencing conflict. Tens of thousands of people have fled both countries and are now living in refugee camps in Uganda. There are many churches functioning in the camps. So Yousif and James (Kenyan recordist) headed for Kampala, the capital of Uganda. They were met by a friend of Yousif and spent several days in Kampala meeting people and finding those whose help they needed in order to gain entrance to the refugee camps. They had opportunities to talk about the ministry of GRN in Kampala churches, to distribute GRN resources, and vitally, met church leaders they could work with in the camps. Yousif and James purchased a bale of second hand clothes in Kampala to provide a material gift to the people they were visiting. This gesture was greatly appreciated by the people as it showed a concern for their physical needs, as well as their spiritual needs. With a letter of introduction, a guide appointed by their local partnering church and a bale of clothes, they boarded a bus bound for Adjumani. Their 10-hour drive, very nearly included a head on collision with another bus. From there they visited the Pagirinya Refugee Settlement (Camp): home to 35,000 refugees and 14 churches. They met with key leaders, distributed recordings and flipcharts and recorded some music and singing. Yousif used his artistic skills to run an art workshop for some children and several people have agreed to work on translating scripts into different languages. 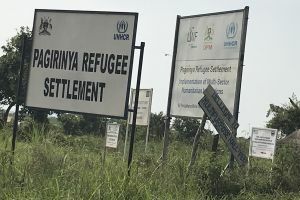 They then made a similar visit to Bweyale and the Kiryandongo Refugee Settlement, home to 52,000 people and 15 churches.The guys learnt which languages were spoken in each camp and an approximate number of speakers of those languages. One pastor was overjoyed and had tears in his eyes as he received the GRN flipcharts. He had used them previously but didn't know where they came from or how to get them. They used 5fish, Sabers and microSD cards to distribute the audio. These churches have few resources. The church leaders in these camps have asked for flipcharts and Sabers. Their request comes to $57,000 for 330 Sabers and nearly 700 picture book sets. Postage and customs would come on top of that. We would love to send them a good proportion of that request. Translations are now underway in a dozen or so different languages. Pray that the translators will be diligent to finish the work they have promised to do and be able to do it well. There are a few unwritten languages as well. Pray for the ability to record in these unwritten languages and for expressive and accurate speakers to speak into the microphone. Yousif and James are now editing and producing the music and songs they have recorded. Pray for them in this work and ask that the finished music might be widely distributed throughout the camps and to speakers of these languages around the world. One thing the people asked was that Yousif and James return to finish the work they have started. 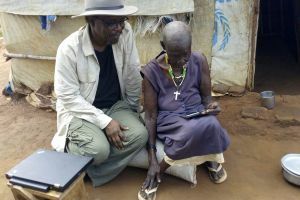 Pray for clear thinking on Yousif's part as he makes plans to record, for God's provision so we can send the requested resources, and for good and effective recordings to be produced for the people of the Nuba Mountains and South Sudan.